The ALLIGATORS avoided the sweep behind another strong outing by Enorbel Marquez-Ramirez, who allowed just one run in a complete game victory. The offense scored once in the fourth and twice in the fifth inning to provide the necessary run support. Julian Steinberg, Dominik Wulf and Patrick Kanthak each scored a run. The BUCHBINDER LEGIONAERE only managed one run on a solo shot by Klaus Hopfensperger in the eighth. Martin Almstetter took the loss. The fourth match decided the series. Alex Lauterbach hit a two-run homerun in the first to lead REGENSBURG to a 2-0 shutout. It was their third win in four games and the berth for the finals. Craig Crow started and was replaced with the bases loaded and one out in the fifth by Philipp Hoffschild, who induced a rally-killing double play. Hoffschild, who had beaten Marquez-Ramirez a week ago in a pitcher’s duel, dominated again and completed the shutout to seal the win. Andre Hughes settled in after the rough start, but lost anyway. 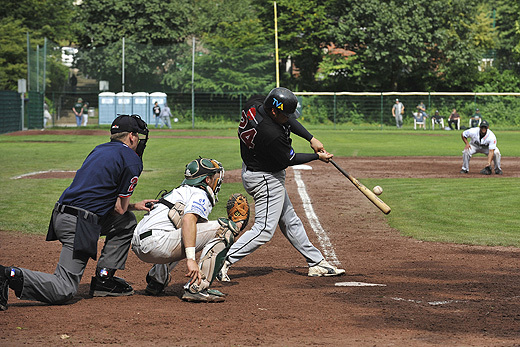 The TORNADOS used their first match ball to advance into the German Baseball-Bundesliga after a sweep against southern conference winner HEIDENHEIM. After winning the first two games in MANNHEIM by a combined score of 3-1, they won game three 6-1 last Saturday. They took a 2-0 lead in the fourth after a pair of errors by shortstop Ryan Lilly and third baseman Andy Janzen. The HEIDEKOEPFE cut the deficit in a half with Lilly’s homerun in the sixth. But the guests blew the score wide open with a four-run eighth. Dominik Hoepfner started with a RBI double. Chris Falls followed with a RBI single, before Jens Heymer made it 6-1 with a two-run single. Paul Waterman picked up the win after allowing five hits, a run and a walk in seven innings. Peter Dankerl gave up nine hits, two unearned runs and two base on balls in 7 1/3 innings. The finals start after the Under 21 European Championship in Pamplona on Saturday, September 13 in Regensburg.